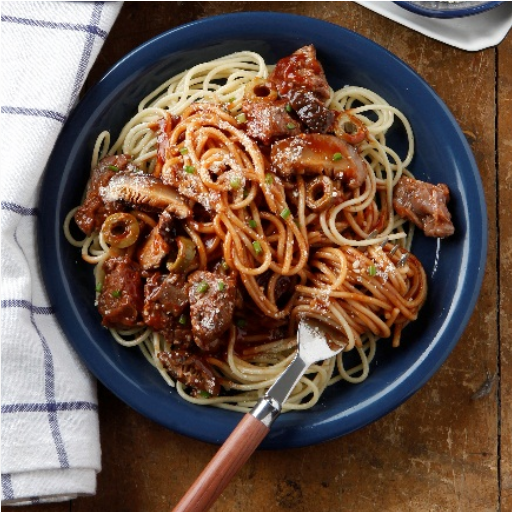 Switch it up for tonight’s dinner with the 100% Sure-Sarap Beef Shiitake Pasta done the quick and easy way with Del Monte Quick n’ Easy Caldereta Mix. 1. Cover and marinate beef in soy sauce and garlic for 30 minutes in the refrigerator. 2. Heat olive oi . Brown meat pcs by batch (3 batches). Put back all meat in the same pan. 3. Add any marinade, DEL MONTE Caldereta Sauce and ½ cup water. Cover and simmer over low heat until the meat is tender about 1 hour, (adding more water if needed), stirring occasional . 4. Add shiitake mushroom and green olives. Simmer for another 5 minutes. 5. Pour sauce over cooked pasta. Top with Parmesan cheese and green onions.